I came across a cute deer and toad stool print on Pinterest and decided to try and replicate the look on my nails. I knew that I wouldn't be able to repeat the deer all over as it would be too intricate so though I'd create more of a 'scene' to incorporate both elements. 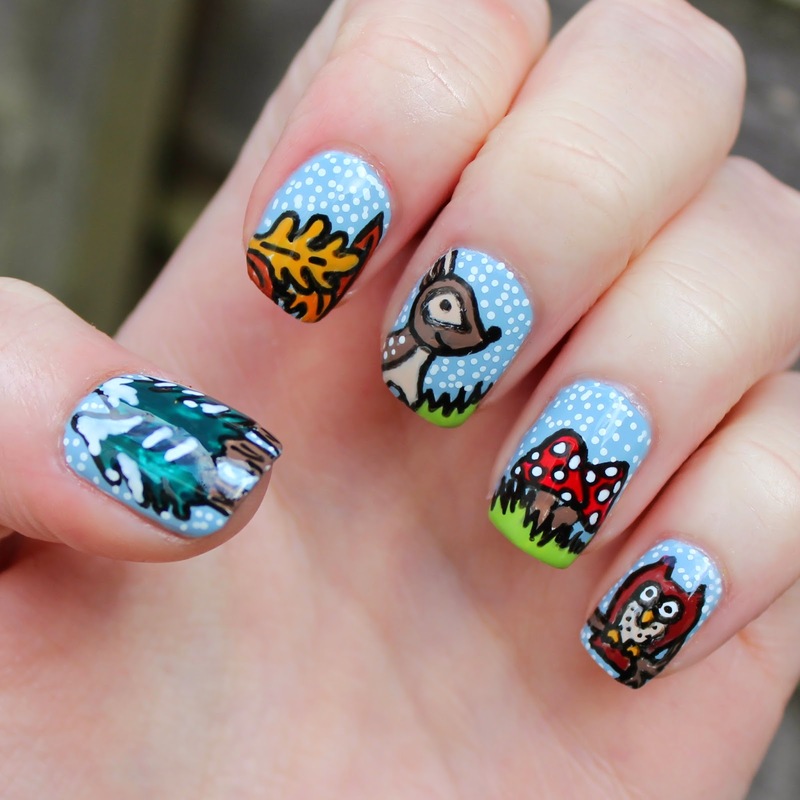 So in addition to the little deer and shrooms I added an owl, some fir trees, and some fallen leaves. And as it's winter I decided to make it snow. I was quite proud of these as I am sooooo not a country girl! I used a whole heap of Barry M nail polishes for this look as you can see in the pic above. If you want me to give you a list or any of the specific colours, let me know. Otherwise the main blue used for the background is Elderberry* from the Gelly range. I painted two coats of this and drew everything on with my white nail pen. I then drew the black outline and filled in the lines with polish. To finish I outlined everything again and used a quick-dry top coat. I love this look! I just wish I could do it on my right hand. These are sooooo cute!! 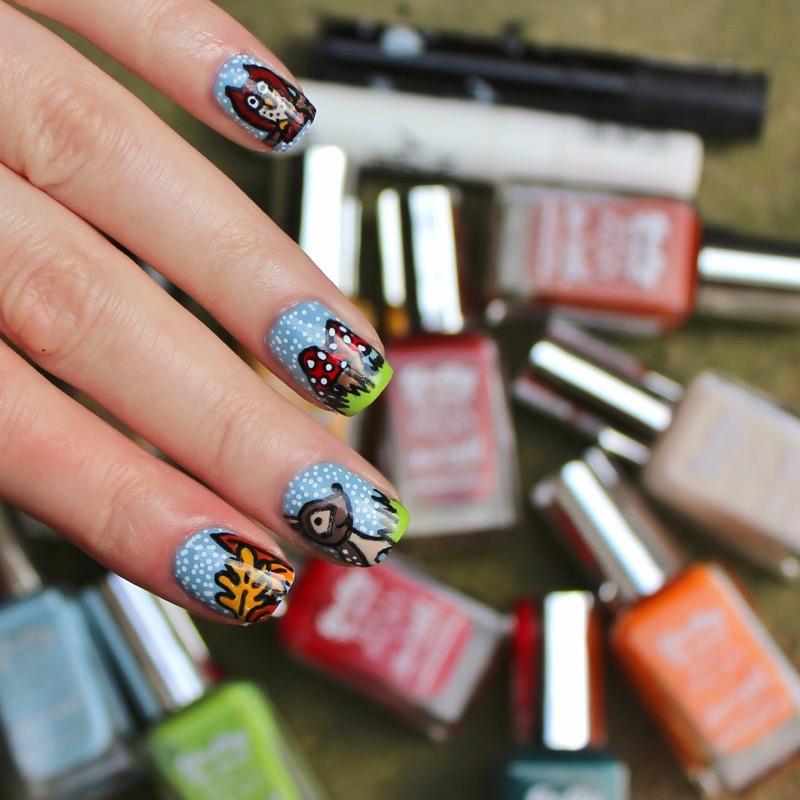 That inspiration print is just adorable and I love that you decided to make it into a scene on your nails instead of just replicating the print. I love the snow as well!